As much as I love the fall, I have to remind myself that technically, it is still summer. It reached 80 degrees yesterday (with low humidity!) so the weather is still keeping it real. Not that it needs to be summer to enjoy some of this deliciousness. With the addition of kalamata olives, this salad was amazing. Make this soon! Cook orzo according to package directions. Drain and run under cold water to cool. While orzo is cooking, combine oil, vinegar, red pepper and zucchini in a large bowl with a bit of salt and pepper. Let marinate for about 20 minutes, tossing occasionally. 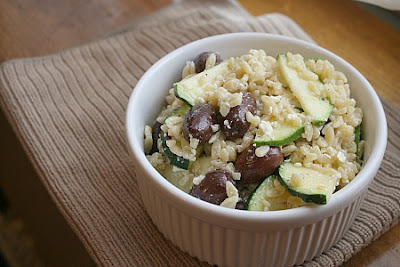 Add orzo, olives, feta and dill to to zucchini mixture. Toss to combine. Serve immediately, at room temp or cold. This entry was posted in feta, pasta, QuickAndEasy, salad, side dishes, zucchini. Bookmark the permalink.